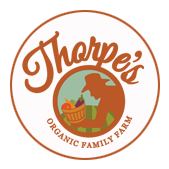 Our entire farm is certified organic, which means we do not use any chemical pesticides, herbicides, fungicides, fertilizers, or genetically modified organisms. We keep our soil healthy and balanced by using our own compost, cover crops, crop rotation, and certified organic fertilizers with rock powders and micro-nutrients. In doing so, we are able to ensure healthier, more nutritionally dense products for you! We use beneficial insects to control destructive insects, and weeds are controlled through mulching, cultivating and a lot of hand weeding! We believe God created a very complex, magnificent system of life. We are doing our best to farm organically, using the many tools He has given us. By God’s grace and our hard work, with the wide diversity of crops, we hope to have an ample supply of delicious, healthy produce to meet our community's needs. Our farm encompasses 2,300 acres, with each and every acre being certified organic. A large portion of our farming acreage is dedicated to growing grains such as organic oats, corn, soybeans, and triticale, as well as hay for our livestock. The livestock including our pigs, chickens, and beef cattle are all fed organically, with access to the outdoors year round. For more information on the process of becoming certified organic, check out NOFA-NY crop certification.